Bepanthen products are formulated to soothe, actively heal and protect your skin from irritations and wounds. 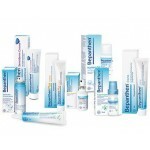 In the event of a skin problem arising for you or your little ones, Bepanthen can provide gentle healing for the skin. Bepanthen has a range of effective products available for the family ranging from treatment of nappy rash to treatment of minor wounds, cuts and abrasions. Bepanthen Antiseptic Skin Cream Bepanthen Antiseptic Cream helps treat cuts and minor wounds. ..
Bepanthen First Aid CreamBepanthen First Aid is specially formulated to protect wounds from infection. ..